Recently on an ABC current affairs program, favourable passing reference was made to how the Coalition’s Environment Minister, Greg Hunt, had thwarted an independent inquiry into the Australian Bureau of Meteorology’s methodology in homogenzing and assessing it historical temperature data. The term ‘conspiratorial’ was used to describe those who questioned the methodology. My ears pricked up as I had read articles by Dr Jennifer Marohasy, a biologist and former research fellow in the Centre for Plant and Water Science at Central Queensland University, and it seemed very unfair to dismiss her argument, based on evidence, as ‘conspiratorial’ (not that they named her). Dr Marohasy is a Senior Fellow with the IPA, the Institute of Public Affairs, a right-wing think-tank. This fact does not strike me as a reason not to consider her arguments, and the evidence on which it is based, though sadly most of my friends who self-identify as left-wing certainly do so. It is a good way to avoid having to think, and is the opposite of the fine example set by Marx and Engels, who drew on the widest sources of information and argument – and relished doing so. Comments are welcome on Dr Marohasy’s point of view which has been summarised as an article for On-Line Opinion , below. For the true believer, it is too awful to even consider that the Australian Bureau of Meteorology could be exaggerating global warming by adjusting figures. This doesn’t mean though, that it’s not true. In fact, under Prime Minister Tony Abbott, a panel of eminent statisticians was formed to investigate these claims detailed in The Australian newspaper in August and September 2014. The panel did acknowledge in its first report that the Bureau homogenized the temperature data: that it adjusted figures. The same report also concluded that it was unclear whether these adjustments resulted in an overall increase or decrease in the warming trend. No conclusions could be drawn because the panel did not work through a single example of homogenization, not even for Rutherglen. Rutherglen is of course in north eastern Victoria, an agricultural research station with a continuous minimum temperature record unaffected by equipment changes or documented site-moves, but where the Bureau nevertheless adjusted the temperatures. This had the effect of turning a temperature time series without a statistically significant trend, into global warming of almost 2 degrees per Century. According to media reports last week, a thorough investigation of the Bureau’s methodology was prevented because of intervention by Environment Minister Greg Hunt. He apparently argued in Cabinet that the credibility of the institution was paramount. That it is important the public have trust in the Bureau’s data and forecasts, so the public know to heed warning of bushfires and cyclones. This is the type of plea repeatedly made by the Catholic Church hierarchy to prevent the truth about paedophilia, lest the congregation lose faith in the church. Mr Hunt defends the Bureau because they have a critical role to play in providing the Australian community with reliable weather forecasts. This is indeed one of their core responsibilities. They would, however, be better able to perform this function, if they used proper techniques for quality control of temperature data, and the best available techniques for forecasting rainfall. Of concern, there has been no improvement in their seasonal rainfall forecasts for two decades because they use general circulation models. These are primarily tools for demonstrating global warming, with dubious, if any skill, at actually forecasting weather or climate. Consider for example, the Millennium drought and the flooding rains that followed in 2010. Back in 2007, and 2008, David Jones, then and still the Manager of Climate Monitoring and Prediction at the Bureau of Meteorology, wrote that climate change was so rampant in Australia, “We don’t need meteorological data to see it“, and that the drought, caused by climate change, was a sign of the “hot and dry future” that we all collectively faced. Then the drought broke, as usual in Australia, with flooding rains. But the Bureau was incapable of forecasting an exceptionally wet summer, because such an event was contrary to how senior management at the Bureau perceived our climate future. So, despite warning signs evident in sea surface temperature patterns across the Pacific through 2010, Brisbane’s Wivenhoe dam, a dam originally built for flood mitigation, was allowed to fill through the spring of 2010, and kept full in advance of the torrential rains in January 2011. The resulting catastrophic flooding of Brisbane is now recognized as a “dam release flood”, and the subject of a class action lawsuit by Brisbane residents against the Queensland government. Indeed, despite an increasing investment in super computers, there is ample evidence that ideology is trumping rational decision making at the Bureau on key issues that really matter, like the prediction of drought and flood cycles. Because a majority of journalists and politicians desperately want to believe that the Bureau knows best, they turn away from the truth, and ignore the facts. News Ltd journalist Anthony Sharwood got it completely wrong in his weekend article defending the Bureau’s homogenization of the temperature record. I tried to explain to him on the phone last Thursday, how the Bureau don’t actually do what they say when they homogenize temperature time series for places like Rutherglen. Mr Sharwood kept coming back to the issue of ‘motivations’. He kept asking me why on earth the Bureau would want to mislead the Australian public. I should have kept with the methodology, but I suggested he read what David Jones had to say in the Climategate emails. Instead of considering the content of the emails that I mentioned, however, Sharwood wrote in his article that, “Climategate was blown out of proportion”, and “independent investigations cleared the researchers of any form of wrongdoing”. Nevertheless, the content of the Climategate emails includes quite a lot about homogenization, and the scientists’ motivations. For example, there is an email thread in which Phil Jones (University of East Anglia) and Tom Wigley (University of Adelaide) discuss the need to get rid of a blip in global temperatures around 1940-1944. Specifically Wigley suggested they reduce ocean temperatures by an arbitrary 0.15 degree Celsius. These are exactly the types of arbitrary adjustments made throughout the historical temperature record for Australia: adjustments made independently of any of the purported acceptable reasons for making adjustments, including site moves, and equipment changes. Sharwood incorrectly wrote in his article that: “Most weather stations have moved to cooler areas (i.e. areas away from the urban heat island effect). So if scientists are trying to make the data reflect warmer temperatures, they’re even dumber than the sceptics think.” In fact, many (not most) weather stations have moved from post offices to airports, which have hotter, not cooler, day time temperatures. Furthermore, the urban heat island creeps into the official temperature record for Australia, not because of site moves, but because the temperature record at places like Cape Otway lighthouse is adjusted to make it similar to the record in built-up areas like Melbourne, which are clearly affected by the urban heat island. I know this sounds absurd. It is absurd, and it is also true. Indeed, a core problem with the methodology that the Bureau uses is its reliance on “comparative sites” to make adjustments to data at other places. I detail the Cape Otway lighthouse example in a recent paper published in the journal Atmospheric Research, volume 166, page 145. It is so obvious that there is an urgent need for a proper, thorough and independent review of operations at the Bureau. But it would appear our politicians and many mainstream media are set against the idea. Evidently they are too conventional in their thinking to consider that such an important Australian institution could now be ruled by ideology. As Europe struggles to deal with a surge in refugees, attention is now shifting to Syria where most people are coming from. But what is the violence they’re fleeing? Many assume that Isis is doing most of the killing, which is partly why so many countries are now talking about bombing Isis in Syria. But the truth is different – and shocking. The vast majority of Syrian civilians killed – more than 95% according to human rights groups – have been killed by the regime of Bashar al-Assad. So why do so many of us have such a bad understanding of where the violence is coming from? Part of the answer may lie in how we hear about the conflict in Syria. The media talks about it increasingly as a “civil war”, a phrase that conjures up images of messy chaos, of various similarly-matched sides fighting each other. Likewise, the United Nations and well-meaning NGOs diligently criticise “all parties to the conflict” which promotes a perception of equal sides – or some sort of balance. But there’s something else too. Part of the answer may lie in the disproportionate obsession with Isis. Our news is full of stories of Isis horror and brutality, but the larger scale state repression of the Bashar al-Assad regime seems to slip by mostly unreported. There was 43 times more interest in Isis than there was in Bashar al-Assad. And that’s taking in global internet users. Same goes for the UK, France and Germany. Astonishing. Together we have collectively airbrushed the biggest perpetrator of human rights violations out of the the Syrian conflict – Bashar al-Assad. Whatever the reason, the obsession with Isis over Assad bears no relation to their respective levels of violence. The implications of this skewed focus are serious. And yet nobody, nobody, is doing anything to curtail the biggest killer in Syria by far – the Assad regime and its air war on civilians. All efforts at stopping the violence in Syria will fail unless we understand where it is coming from. The story of the data is unarguable – if we want to stop the killing of civilians in Syria we have to address the Assad regime. Arm those around you with the facts. Share this with your friends and family. It’s crucial that we get the story right. 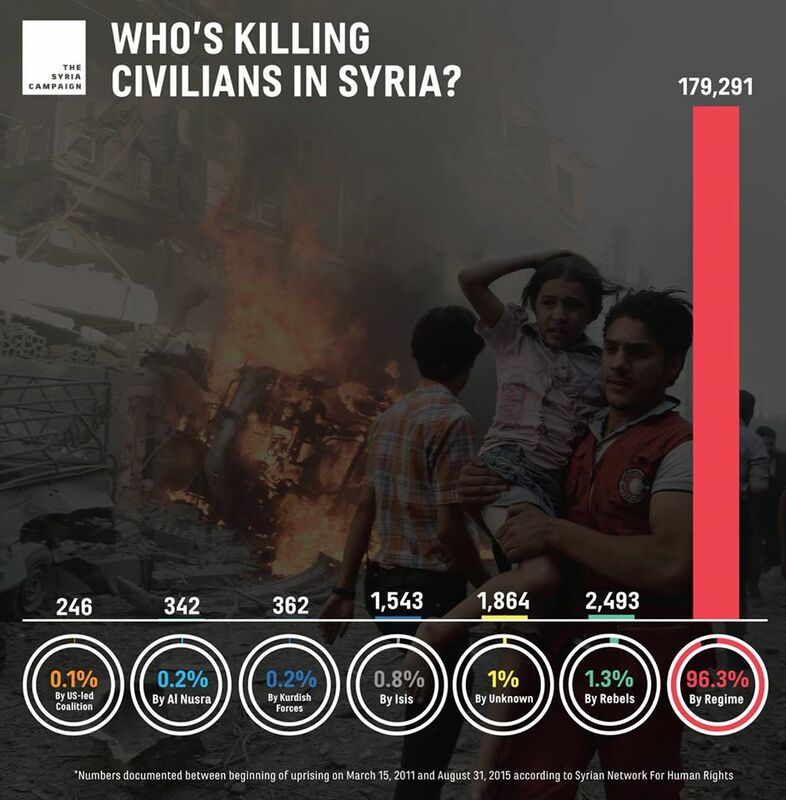 Nine months ago, data from a separate human rights organisation, the Violations Documentation Center, revealed an almost identical proportion of civilian killing by the regime – 95%. Reblogged with permission of Bill Weinberg and his World War 4 Report. The Washington Post story (June 12, 2015) actually reports that Congress was moving to cutCIA aid to the rebels. Again citing unnamed or fuzzy sources, the account claims the CIA has spent around $1 billion over the past “several years” to arm and train Syrian rebels—but emphasizes again that the primary enemy is ISIS, not Assad. So of Johnson’s four sources, it is only the last that vaguely backs up his claim. And he leaves out two salient facts: that the aid is primarily directed against the jihadists who Assad is also fighting, not Assad; and that it is coming to an end. Johnson does mention the far less ambitious but better publicized Pentagon program to train Syrian rebels, admitting it has been an “abysmal failure.” He doesn’t mention (as we have) that the fighters trained under this program amount to a whopping 54—of whom only 37 were still actually in combat last time we checked back in August. Nor does he mention (as we have) that rebels have refused to participate in the training program because of the Pentagon’s insistence that they do not use their training to fight Assad—only ISIS. After this subterfuge, Johnson goes on to gripe that the Sept. 13 New York Times story fails to mention the CIA training program. Distortions, eh? Cast the beam from thine own eye, Adam. As the military build-up and posturing in Syria between Russia and the United States escalates, policy makers and influencers on this side of the Atlantic are urgently trying to portray the West’s involvement in Syria as either nonexistent or marked by good-faith incompetence. By whitewashing the West’s clandestine involvement in Syria, the media not only portrays [sic] Russia as the sole contributor to hostilities, it absolves Europe and the United States of their own guilt in helping create a refugee crisis and fuel a civil war that has devastated so many for so long. Oh really, Johnson? How many of the refugees are fleeing the FSA, as opposed to Assad’srelentless aerial bombadment and ISIS sectarian cleansing? A case can be made that it is the West’s failure to meaningfully support the rebels—without condescending conditions that they don’t fight Assad—that has led to the disaster in Syria. The notion that “the West” is to blame for the refugees is literally echoing Assad’s propaganda. See CNN Sept. 16 (“Syria’s Bashar al-Assad: West is to blame for refugee crisis”). Indeed, the key reason for displacement in Syria is not IS, but Assad. The regime’s air force is killing at least seven times as many people as IS. This “terror from the air”, as it is referred to by civil groups, is destroying all those areas controlled by rebels—both moderate and Islamist. The aid organisation Doctors Without Borders reported that in August “heavy bombardments were carried out on 20 consecutive days in besieged Eastern Ghouta” where it is supporting 12 provisional underground clinics… One in every four victims—whether dead or injured—was a child under the age of five. But you would get no sense of that from the ironically named Fairness & Accuracy in Reporting. This is the same FAIR, recall, that was eager to jump on utterly dubious claimsthat the rebels and not the Assad regime were behind the Ghouta chemical attack. Now it is plugging the utterly fictional notion of a “CIA Effort to Overthrow Syria’s Government.” Bunk. On the contrary, the US is tilting to Assad, viewing ISIS as the greater and common enemy. This is a betrayal of the Syrian revolution, which is ultimately even counter-productive to the aim of fighting ISIS. Telling the secular and pro-democratic forces they must accept rule under one tyrant is hardly conducive to a strong resistance against a rival gang of fascists. Why does the increasingly reactionary FAIR continue to have any legitimacy whatsoever? The Assad regime is still in power, killing seven times more civilians than Isis. World leaders have to act to stop the bombs from the sky. We can survive sniper fire, chemicals but the barrel bombs are unbearable. A no-fly zone or creation of safe zones would save lives instantly. And I would be the first person on the way home. I’m writing this to you from a refugee camp in Germany. All the Syrians here are so grateful for the welcome people have given us but we want to live in Syria, not Germany. I was 22 when the fighting started in 2011. I was living in a neighbourhood called Ghouta, a short drive from Damascus. A year after the uprising the regime of Bashar al-Assad placed Ghouta under siege – this means nothing comes in or out – no food, no medicine, nothing. 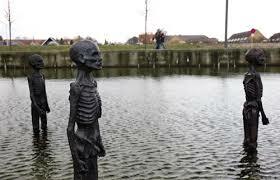 A year after that the regime attacked us with chemical weapons and more than a thousand were gassed to death. For years they have also dropped barrel bombs and missiles on us from regime aircraft. Normally we got struck eight times a day. How could we continue to survive that hell on earth? I had to cross twenty checkpoints on fake documents to make it out of Syria. Each time your heart stops as you know that there is a chance you will be arrested and taken away. I made it out and survived a death boat. I have survived so many ways a human being can be killed. At home I was a medical student. We had so many attacks I assisted more surgeries than most surgeons do by the time they retire. My dream is to only have to perform ‘normal surgeries’, what I trained for, not picking shrapnel from bombs out of children’s limbs. World leaders have to act to stop the bombs from the sky. We can survive sniper fire, chemicals but the barrel bombs are unbearable. A no-fly zone or creation of safe zones would save lives instantly. And I would be the first person on the way home. The regime of Syrian President Bashar al-Assad is the root cause of the conflict in Syria and, by extension, the refugee crisis that is now hitting Europe, as Syrians flee their homeland in their millions. Abubakr al-Shamahi (Date of publication: 8 September, 2015) Originally published at alaraby. Planet Syria, a network of more than 100 civil society groups working across Syria, briefed MPs and journalists at the Houses of Parliament in London before a parliamentary foreign affairs select committee meeting on Syria. The panel assembled by Planet Syria argued that the regime of Syrian President Bashar al-Assad was the root cause of the conflict in Syria, and, by extension, the refugee crisis that is now hitting Europe, as Syrians flee their homeland in their millions. “We asked activists how the world can help… People on the ground are specifically asked for a no-fly zone,” Mustafa Haid, a spokesperson for Planet Syria and the chairperson of Syrian nonprofit Dawlaty, told al-Araby al-Jadeed. “We came to deliver their message, people under the barrel bombs are asking for this,” Haid added. The imposition of a no-fly zone would almost certainly involve a barrage of bombing raids against Assad’s many airbases, refuelling infrastructure, storage hangars and other facilities spread around the country. Such operations are rarely casualty-free. Haid, as well as his fellow spokesperson Assaad al-Achi, an economist before he became an activist, relayed their own experiences in Syria. They also highlighted the damage caused by barrel bombs, which were described by Human Rights Watch in August as a greater threat to Syrian lives than the Islamic State group that has ravaged parts of Syria and Iraq. “Syrians have described to me the sheer terror of waiting the 30 seconds or so for the barrel bomb to tumble to earth from a helicopter hovering overhead, not knowing until near the very end where its deadly point of impact will be,” HRW executive director Kenneth Roth said. The British parliament rejected a move by Prime Minister David Cameron for military action against Assad in 2013, a vote that eventually weakened US President Barack Obama’s resolve to attack the Syrian regime, following a chemical weapons attack that killed hundreds of civilians in Damascus. Activists, however, argue that prior inaction by the international community and the non-implementation of various UN resolutions against Assad have led to the current catastrophic situation, and that a no-fly zone would not involve Western troops fighting on the ground. John Lee, an administrator of Open Borders website. Barry York’s case for amnesty for asylum seekers in Australia,Open Borders: The Case, May 11, 2015.